Last week, physicists at the National Institute for Standards and Technology reported they'd cooled an object to a million times colder than room temperature. It was a record for the super-difficult science of super-cooling. 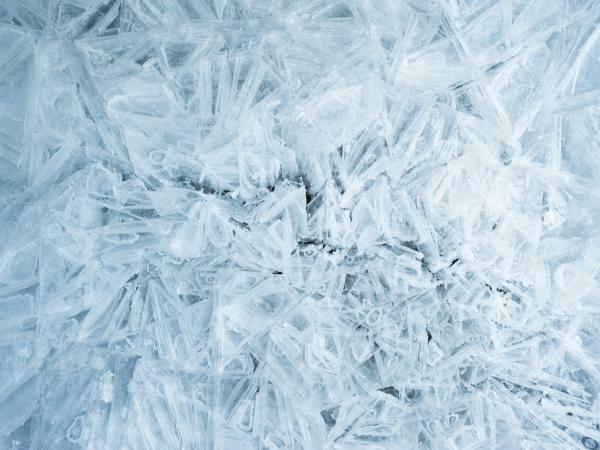 In this field, researchers inch ever closer to — but never reach — the state of absolute zero temperature. It's a science that has some very cool (pun very much intended) applications including ultra-sensitive gravity wave detectors for "hearing" distant black hole mergers. But moving beyond these applications, why is super-cooling so hard to begin with? Why can't we just get to absolute zero degrees and be done with it? The answer to this question drops us straight into one of the quantum universe's most startling features: The world never rests. To see what this means, let's remind ourselves about the meaning of "temperature." Without getting too technical (we should really be talking about entropy here), temperature for physicists is a measure of random motion. Imagine the gas molecules in the air around you are little cue balls of matter. The higher the air temperature, the faster those little orbs of matter will be ricocheting around the room, bouncing off the walls and each other. So cooling the air means finding some means to slow the molecules down. From this perspective, there there's no conceptual reason why you shouldn't be able bring them entirely to a halt. Do that, and the air would have a temperature of "absolute zero" degrees (as measured in units called Kelvins. In Fahrenheit, this would be -459.67 degrees). But, it turns out, nature doesn't work that way. The universe doesn't "do" zero temperatures because it doesn't do zero motion. Thinking about matter and motion in the way we described above is what we physicists call "a classical picture." In classical physics, matter is made of tiny particles of "stuff" and motion is just the change in the particles position with time. It all makes intuitive sense based on our experience of the world at the scale of baseballs and boulders. But a hundred years or so ago, physicists began probing the world on the scale of atoms. What they found was the classical, intuitive picture didn't work well for explaining their experiments. In response, they developed a new kind of physics. In an astonishing burst of creativity, they kept key principles from the classical world — like the conservation of energy — but added new rules. One of these was the Uncertainty Principle, which essentially told us that reality is fuzzy at its root level. To be exact, certain pairs of properties — like motion and position — can never be known exactly. The Uncertainty Principle isn't saying there's something wrong with our instruments. Instead, it tells us there's something wrong with our classical intuitions. In particular, when it comes to motion, it tells us it's impossible to know the position and the motion of a particle exactly. The more you lock in the position of a particle, the wider the range of velocities the particle can have. So what does this have to do with temperature? Absolute zero should mean bringing particles to a halt. But that would imply you knew exactly where they were. You had them perfectly "localized." If that's the case, then the Uncertainty Principle demands there must be some uncertainty in their motion. They can't be perfectly known to be perfectly at rest. The deeper meaning of this this quantum logic is that the universe can never be at rest. There is a "floor" to how much things can be slowed down (or cooled). It's impossible to go below that floor (though scientists do get ever more clever in skirting its edges). The implications of this can get pretty strange. Imagine we put a particle, like an electron, in a box. Now we ask: What's the lowest energy state of the electron + box system? In classical physics, it would just be the electron sitting there unmoving — i.e. zero motion, hence zero energy. But quantum physics won't allow such a thing as zero energy (because of the Uncertainty Principle). Instead, the system has non-zero "ground state" energy with the electron bouncing back and forth between the box walls. That's as low as you can go. The electron can't be stopped. Take this idea further, and you get to the delicious idea of vacuum energy. There the Uncertainty Principle demands that there can be no pure and perfect vacuum with a state of zero energy. Thus, in quantum physics, the vacuum is not empty but is a seething froth of "virtual particles" that are never manifested and yet have a verifiable effect on the particles we do see. No vacuum. No zero energy. No zero temperature. No common sense expectation about the world's behavior. The discovery that the quantum world was the foundation for our common-sense classical experience was a triumph of science. It was a validation of science's ability to take us beyond our limited senses and limited concepts. There is no way to "picture" this quantum world with our classical imaginations. Instead, what we found was a new frontier. At its root, quantum physics showed us that this world we inhabit is dynamic to its very core: buzzing, roaring, shuddering and trembling like an infinite Jackson Pollack painting. It is not just richer than we imagined, but stranger and more wonderful than we can imagine. That view, hidden in the impossibility of absolute zero temperature, is a gift that science has given us all. Now what are we to make of it?